Inverting the Interaction Cycle to Model Embodied Agents (2014). Olivier L. Georgeon and Amélie Cordier. Procedia Computer Science, 41, pp 243-248. 5th Annual International Conference on Biologically Inspired Cognitive Architectures. doi:10.1016/j.procs.2014.11.109. This paper relates very much to the first lesson of the IDEAL MOOC. Learn to create your own self-programming agent and robot in my course on developmental learning. French original version available here. 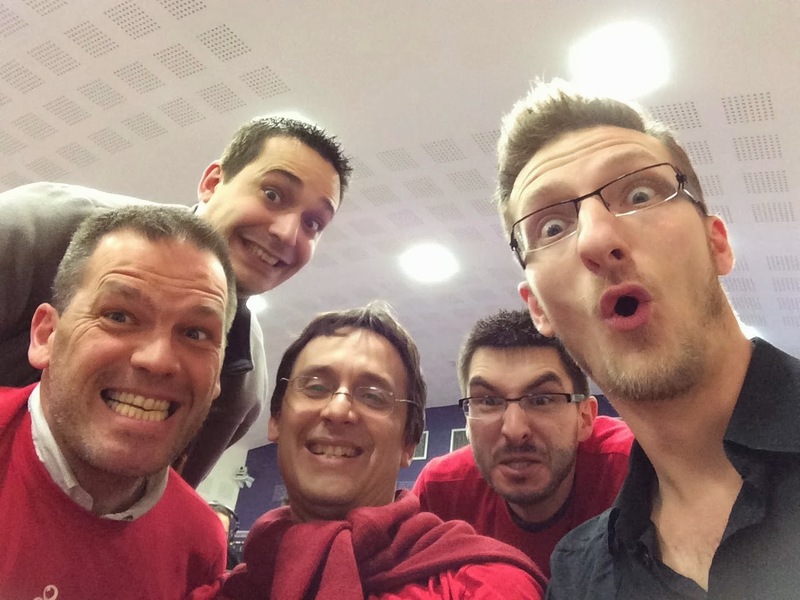 We won the jury's favorite prize ("coup de coeur du jury", 4th prize) at the Lyon Startup Weekend ! The IDEAL team from left to right: Renaud Detaille, Raphaël Cazorla, Olivier Georgeon, Séverin Bruhat, and Julien Millet. Great thanks to the organizing team for this crazy unforgettable weekend. We love you too ! Watch the finale video (our presentation from time 2:47:37 to 2:56:20, low audio quality French).